Tetris meets Final Fantasy? That can't work, surely? We lift the lid on one of the most interesting DS releases of the year. When developers mix widely opposing game genres it usually results in a bit of a mess. This is the main reason why I initially gave Puzzle Quest a fairly wide berth when I saw it in my local videogame store a few weeks back. The vaguely generic fantasy artwork coupled with the fact that from the screenshots alone it resembled a poor ‘Bejewelled’ clone led me to believe that this new puzzle title wouldn’t be ousting Zoo Keeper from my DS anytime soon. I’m not usually wrong about stuff like this (if I may say so myself) but boy, was I wrong this time. Very wrong. Puzzle Quest is one hell of a game. Yes, it’s a fusion of role playing and puzzling, but the combination is handled with such aplomb that it makes you wonder why no one else has every attempted such an audacious mixture in the past. At the core of the game is your standard-issue ‘Bejewelled’ clone, but this is augmented with various RPG elements such as hit points, experience, spells and gold. By linking up three or more coloured gems the player is able to increase their Mana stock and consequently cast a range of different spells. Combining three or more gold icons grants cash that can be spent on armour and items. Doing the same with purple stars gives experience (your character levels up, just like in a standard RPG). The final and most important piece on the playing field is the skull - linking these together inflicts damage on your opponent. The first to shed all their life points loses. 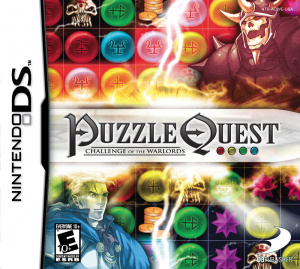 If the game just involved these puzzle battles it would be epic, but the developer has given the player a massive quest to complete as well. Behind all the puzzling is a pretty solid (if unoriginal) plot involving the usual ‘kingdom beset by war’ scenario. The game world is represented by a map and as you progress more locations are opened up. There are ‘primary’ quests which must be completed in order to drive the story forward, but the secondary, optional tasks are just as vital in that they allow you to gain experience and earn gold. The number of quests available is truly staggering and in terms of play time Puzzle Quest rivals ‘proper’ RPGs like Final Fantasy and Phantasy Star. You can also add to your fortress by building sections like a stable (for training ‘mounts’), a forge (for creating new items) and a Temple (for gaining new skills). If this wasn’t enough, you can also collect various runes and combine them to build new weapons. To say the game has depth is something of an understatement. In addition to the massive quest mode there are single player options as well, should you wish to jump right into a battle or simply play against a friend. Unfortunately, there are some negative aspects to the game. For starters, the graphics are a decidedly mixed bag. The art style (which is a cross between Japanese anime and Western Dungeons and Dragons) is nice enough but the actual in-game visuals are pretty rough around the edges. The PSP version (released at the same time) has much cleaner and crisper graphics and it’s highly likely that the Nintendo version was simply scaled down this prettier template. There are also reports of some annoying bugs which cause the game to crash, but I’ve only experienced one such lock-up myself so it’s hardly a massive issue. 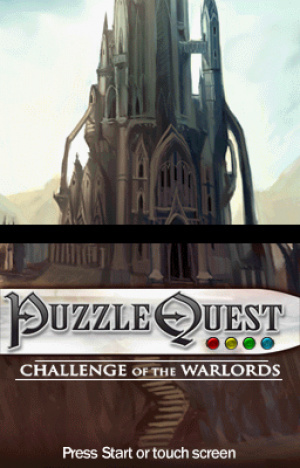 Puzzle Quest can also be extremely challenging thanks to some amazingly smart (not to mention fiendish) enemy AI. Because the computer knows what items are going to drop from the top of the screen next, you will notice that it sometimes makes very weak starting moves purely because it knows that it will be able to capitalize on some powerful items on the next turn. It’s annoying and at times very unfair, but the fact that the player can always upgrade their weapons and armour to give them the edge balances things out a bit. Besides, a hard game means good value for money in my book. As I said at the start of the review, I was almost going to pass this game up. Thankfully, the buzz that is currently sweeping the internet prevented me from doing so, otherwise I would have been missing out on one of the most essential DS purchases this year. It is slighly rough in places and it's highly likely that the developers will improve on this excellent concept with a sequel, but in the meantime you really should do yourself a favour and check this fantastic game out. OMG! This game is addictive, I picked it for $20 at my local electronics store, and it is well worth each and every penny I spent on it. Great addictive games. 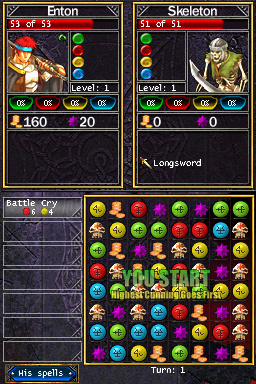 Bejeweled is one of the few puzzle games I like and wrapping it in an RPG skin was brilliant. 9/10: This is quite impressive! The story is banal and the quests are uninteresting, but the actual gameplay sets this title apart. For example, should you cast an attack spell, cast a spell to drain your opponent's mana, or go for the skulls? The RPG battle elements nicely complement the Bejeweled game to create a challenge that is far more than the sum of its parts. The musical score is even superb. This is one of the top DS games I have played, and I am looking forward to the sequel!